When it comes to making chic style statements, a Bollywood star who never fails to impress is Kangana Ranaut. This year particularly, we have been noticing the diva shower some special love for Indian ethnic wear. From nailing airport fashion in pretty sarees to making a case from cotton suits, she has been giving us all the right reasons to notch up our ethnic wardrobe to look on point. This festive season too, she is setting ethnic style goals by picking standout designs yet again. 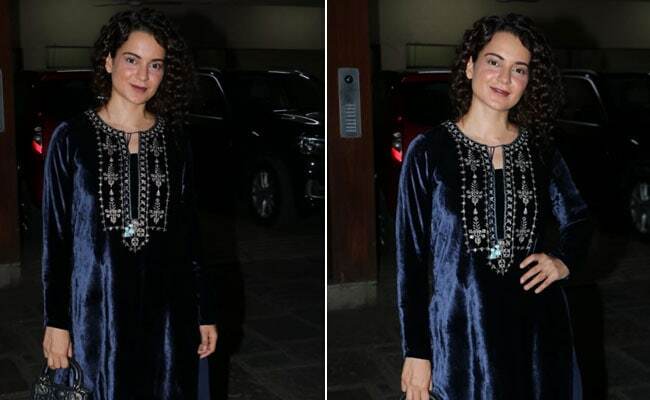 We recently spotted Kangana at the birthday celebrations of Manikarnikaproducer Kamal Jain in Mumbai, when she instantly stole all attention in a gorgeous midnight blue velvet suit by Global Desi. The luxurious full sleeve kurta had intricate embellishments in the front and it was teamed with a matching palazzo. To complete her look, Kangana wore a trendy pair of blue juttis from Good Earth and carried a mini black handbag with quilted detail from Dior. Give a chic spin to your ethnic wardrobe by adding velvet suits to it. This magenta suit comes with buttoned placket at the front, embroidered cuffs and floral embroidered dupatta. Team this pretty suit with trendy accessories to grab all attention this festive season. This blue suit includes a boat neck kurta with embroidered patterns and sheer sleeves, and contrast salwar and dupatta. Look festive perfect in this velvet suit that features a sequin panel at the front and embroidered patterns, and comes with a contrast dupatta. Make a chic style statement like Kangana Ranaut by including gorgeous velvet suits in your ethnic wardrobe.